PhotographyBlog: Rated 5 stars out of possible 5. First announced back in July 2005, the FujiFilm Finepix E900 hasn’t really set the world on fire, despite offering one of the highest megapixel counts around. It’s not been at the top of the PhotographyBLOG review list, but having tested the camera, I’m beginning to regret not taking a look earlier. 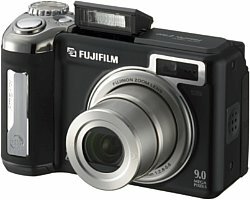 The FujiFilm Finepix E900 is simply one of the best compact digital cameras that I have reviewed. It offers excellent image quality with a useable ISO range of 80-400 and few chromatic aberrations, fast operation in most areas of performance, and a full range of creative shooting modes. The 32-128mm lens is a little wider than most compact cameras and the overall design is intuitive to pick-up and use. Best of all, the E900 is now available for 199 pounds at Amazon UK, which is amazing value for a 9 megapixel camera that actually delivers on most of its promises. Sure, there are a few weak points to consider. The optical viewfinder only offers 77% scene coverage, the LCD screen has a pretty low resolution, the RAW mode is slow to shoot and really requires Adobe Photoshop CS2 to get the most out of it, and the lack of a focus-assist lamp is puzzling. Despite these flaws, the FujiFilm Finepix E900 is still a joy to use and is highly recommended, especially given that attractive price tag.